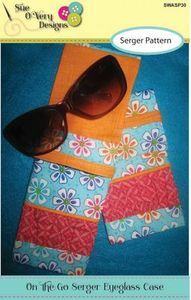 Set up your serger, pull out your presser feet and whip up this On-the-Go Serger Eyeglass case in no time! Pattern designed to work with any 4-thread serger and a few extra presser feet: 5mm cording foot, Ruffling foot, 3/4in Belt look binder (optional with 5-thread serger). Pick three fat quarters, a bit of cording and some other fun sewing essentials. Eyeglass case features no raw edges inside, piping, ruching and easy to follow instructions. Final dimensions: 3-1/2in wide x7in long.